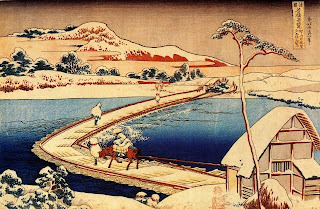 I chose Hokusai’s painting “Kozuke Sano funabashi no kozu” to discuss because of it reflects two of the traditional Japanese aesthetics. The first aesthetic being simplicity, and the second being suggestion rather than statement. This painting suggest quite a bit. For example, the dark black color at the top of the painting which begins to fade into a lighter shade suggests that it is evening. Furthermore the scene that is shown suggests that the people in it are farmers. Take for example the hills in the distance; they appear to be koku hills (hills used to grow rice). Further supporting this idea is the man on horseback who carries a sack of what could be rice behind him. The style in which the painting was done appealed to me because everything seemed to guide my eye to something else. The dark blue of the water guided my eye to the hut in the corner which then led me to look at the man on horseback. The bridge seems to lead the eye to the mainland where the koku fields are and the shape of the hills works to give the viewer a sense of the space. This painted was done in such a way that is makes me feel as if I am intruding on every day village life in Tokugawa Japan. Great post, Brittnae. Notice how the tree in the foreground sets up the foreground that also leads you back to the mountain in deep space, and the minimalism or economy of the composition (what you so rightly call "suggestion" is also communicated by the very faint colors and the simple use of line. .